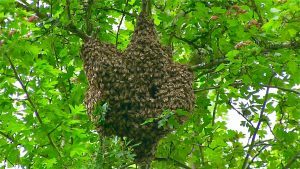 Listening to this audio of the hive is a wonderful way to enter the world of bees. This powerful audio is healing. Use it during meditation and quiet moments when you can enter your heart space. This audio is what the bees call “The Song of Increase” and happens at specific times when the colony is at its peak of success. This is an immensely happy time when the hive is near perfection with every bee in full participation. This bee song draws the listener in and goes right inside you in an uplifting way. Listen to it when you can allow the bee song to enter and heal you. Please do not listen to it while driving or doing something that requires you to pay attention elsewhere. Robin, a professional audio engineer, used her high level skills to record and master this audio. If you listen to this audio with stereo speakers or with headphones, it will enhance your experience of what it’s like to be in the midst of the bees. The cost of this 40 minute CD is $12, shipping included. Email your order to Robin – robinwise9@gmail.com. She will send you a PayPal link for payment and will get that right out to you via USPS. Be sure to include your mailing address. There is an 18 minute MP3 file available. You’ll find that here.